Hei, tällaisia joulukortteja lähti tänä vuonna, kuvat ovat huonoja kiireen ja hämärän sään takia ja menneet mitkä menneet! Mustetettu kohokansio, hanki- ja peurastanssit, kohotarroja! 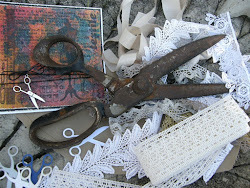 Hi, I made these kind of cards for relatives this year, some pieces still lying here on the corner of the craft table! 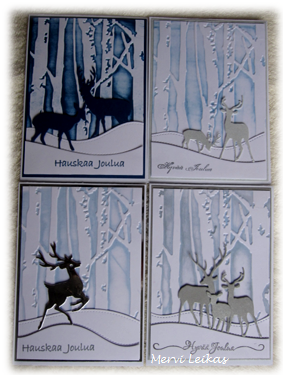 Different colours of inks and cardstocks and Christmas greetings. 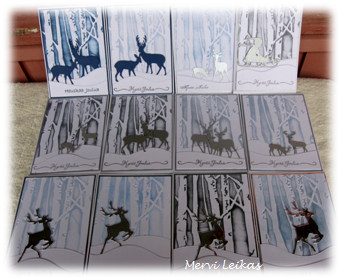 Info: Sizzix embossing folder (trees); snow hillside die cuts: IO and Lawn Fawn. Lovely combinations of dies ad inks Mervi. Todella upeita. Kauniita nuo peurat. todella upeat kortit teit! Jouluksi en saanu yhtään ainutta korttia valmiiksi... tänä vuonna meinaan tehdä aina silloin tällöin...niin on ainskin muutama! =) Oikein rattoisaa päivän jatkoa! Wow, these are so stunning all lined up! Gorgeous cards! This is a beautiful combination of dies. The trees and deer are so lovely. You made so many lovely cards with this great design. Wow, you got so many cards done! They look great! Wow, what a stunning collection of cards. I love the embossing folder and the dies you've used. These are all fabulous Mervi, love the different colour ways too. Wow, great cards, thanks for playing along with us at Catch The Bug. Such a clever design for mass production, and not one card us totally alike! And I love reindeer on Christmas cards. I saw you won a prize with these over at Bugaboo, congrats!